Listening to DevOps industry pundits, you might be convinced everyone is running containers in Production (or by now, serverless). Although containerization is growing at a phenomenal rate, several recent surveys¹ indicate less than 50% of enterprises are deploying containers in Production. Filter those results further with the fact, of those enterprises, only a small percentage of their total application portfolios are containerized, let alone in Production. As a DevOps Consultant, I regularly work with corporations whose global portfolios are in the thousands of applications. Indeed, some percentage of their applications are containerized, with less running in Production. However, a majority of those applications, even those built on modern, light-weight, distributed architectures, are still being deployed to bare-metal and virtualized public cloud and private data center infrastructure, for a variety of reasons. Due to the scale and complexity of application portfolios, many organizations have invested in enterprise deployment tools, either commercially available or developed in-house. The enterprise deployment tool’s primary objective is to standardize the process of securely, reliably, and repeatably packaging, publishing, and deploying both containerized and non-containerized applications to large fleets of virtual machines and bare-metal servers, across multiple, geographically dispersed data centers and cloud providers. Enterprise deployment tools are particularly common in tightly regulated and compliance-driven organizations, as well as organizations that have undertaken large amounts of M&A, resulting in vastly different application technology stacks. Better-known examples of commercially available enterprise deployment tools include IBM UrbanCode Deploy (aka uDeploy), XebiaLabs XL Deploy, CA Automic Release Automation, Octopus Deploy, and Electric Cloud ElectricFlow. While commercial tools continue to gain market share³, many organizations are tightly coupled to their in-house solutions through years of use and fear of widespread process disruption, given current economic, security, compliance, and skills-gap sensitivities. Enterprise deployment tools are normally integrated with open-source packaging and publishing tools, such as Apache Maven, Apache Ivy/Ant, Gradle, NPM, NuGet, Bundler, PIP, and Docker. Binary packages (and images), built with enterprise deployment tools, are typically stored in private, open-source or commercial binary (artifact) repositories, such as Spacewalk, JFrog Artifactory, and Sonatype Nexus Repository. The latter two, Artifactory and Nexus, support a multitude of modern package types and repository structures, including Maven, NuGet, PyPI, NPM, Bower, Ruby Gems, CocoaPods, Puppet, Chef, and Docker. Mature binary repositories provide many features in addition to package management, including role-based access control, vulnerability scanning, rich APIs, DevOps integration, and fault-tolerant, high-availability architectures. Lastly, enterprise deployment tools generally rely on standard package management systems to retrieve and install cryptographically verifiable packages and images. These include YUM (Yellowdog Updater, Modified), APT (aptitude), APK (Alpine Linux), NuGet, Chocolatey, NPM, PIP, Bundler, and Docker. 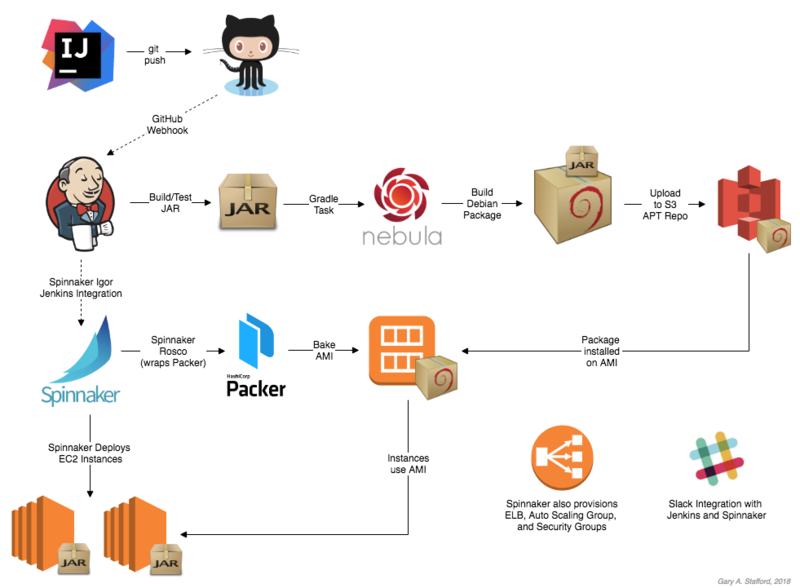 Packages are deployed directly to running infrastructure, or indirectly to intermediate deployable components as Amazon Machine Images (AMI), Google Compute Engine machine images, VMware machines, Docker Images, or CoreOS rkt. One such enterprise with an extensive portfolio of both containerized and non-containerized applications is Netflix. To standardize their deployments to multiple types of cloud infrastructure, Netflix has developed several well-known open-source software (OSS) tools, including the Nebula Gradle plugins and Spinnaker. I discussed Spinnaker in my previous post, Managing Applications Across Multiple Kubernetes Environments with Istio, as an alternative to Jenkins for deploying container workloads to Kubernetes on Google (GKE). The Nebula plugins and Spinnaker leverage many underlying, open-source technologies, including Pivotal Spring, Java, Groovy, Gradle, Maven, Apache Commons, Redline RPM, HashiCorp Packer, Redis, HashiCorp Consul, Cassandra, and Apache Thrift. Both the Nebula plugins and Spinnaker have been battle tested in Production by Netflix, as well as by many other industry leaders after Netflix open-sourced the tools in 2014 (Nebula) and 2015 (Spinnaker). Currently, there are approximately 20 Nebula Gradle plugins available on GitHub. Notable core-contributors in the development of Spinnaker include Google, Microsoft, Pivotal, Target, Veritas, and Oracle, to name a few. A sign of its success, Spinnaker currently has over 4,600 Stars on GitHub! 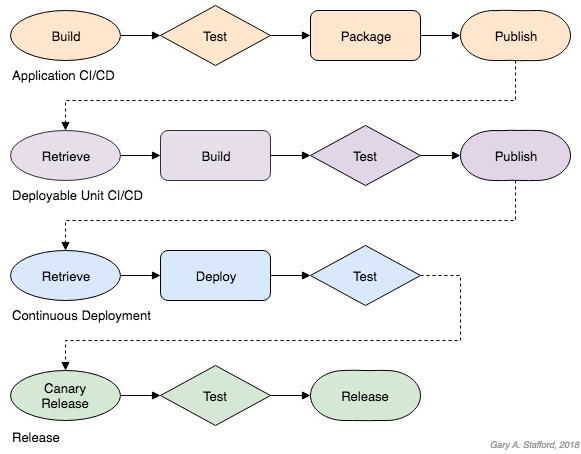 The overall build, test, package, bake, deploy process will look as follows. This entry was posted on May 10, 2018, 11:48 am and is filed under AWS, Build Automation, Continuous Delivery, Enterprise Software Development, Java Development, Software Development. You can follow any responses to this entry through RSS 2.0. You can leave a response, or trackback from your own site.